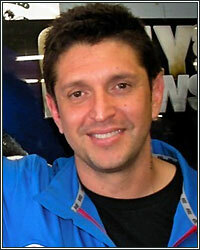 ALEX ARIZA: "I SPOKE DIRECTLY WITH TEAM CHAVEZ...IT'S ABSOLUTELY NOT TRUE"
"I spoke directly with Team Chavez. They called me personally and said it's absolutely not true. This is ridiculous, completely untrue, completely unfounded and they will be here on Thursday to start getting ready for his next fight," stated strength and conditioning coach Alex Ariza, who spoke to Timothy James of MPBoxing.com moments ago to set the record straight regarding rumors that he had been let go by the the camp of Julio Cesar Chavez Jr. According to Michael Marley of Examiner.com, a "boxing birdie" informed him this morning that Ariza had "separated" from the team of Chavez Jr., who is currently trained by five-time Trainer of the Year Freddie Roach. Evidently, those rumors couldn't be further from the truth, at least that's what Ariza was told directly from representatives of Team Chavez. This marks the second time in just two weeks that rumors have surfaced regarding Ariza and his alleged release from certain camps. After parting ways with WBA jr. welterweight champion Amir Khan, wordy quickly spread that Ariza would soon be fired by pound-for-pound Manny Pacquiao. Although those rumors were squashed by Pacquiao himself, these latest rumors of Ariza's departure from Team Chavez have begun to surface, prompting the strength and conditioning coach to reach out to members of the camp himself in order to get the truth and set the record straight. Given these latest updates, one has to wonder if Marley's "boxing birdie" is Michael Koncz, who Ariza was quick to blame as the source for the first set of rumors.